This post is sponsored by Simply Organic. All opinions are my own. You know how sometimes things taste WAY better than they look? Yea, well, that’s how I feel about today’s absolutely delicious casserole post – so you’re just going to have to trust me and my family on this one! My carnivorous brother-in-law Kevin, a serious casserole connoisseur, said that this was “the BEST casserole!” he’s ever had, out playing any meat rivals. No joke. In fact, he said he didn’t miss the meat at all. My sister said that this is the perfect dish to exemplify ‘I can’t believe it’s not meat and cheese!’ Because truly, with the heartiness of the beans, vegetables and cashew cream, it really is a complete and totally satisfying meal for meat eaters and non meat eaters alike. When I was a kid, my mom used to make what came to be one of my family’s favorites – MEXICAN LASAGNA. Layered with a tortilla base, ground beef and tomatoes, a cottage cheese/egg mixture, cheddar cheese and topped with canned fried onions – it was a real winner back in the day. A couple decades later, I thought I would veganize, de-gluten and healthify that recipe! ? The result is one big, creamy casserole layered with beans, veggies and cream. I think this is the perfect recipe to feed a group, whether you’re making it with a group of friends or for your family. You can even make it ahead of time and then simply pop it in the fridge until you’re ready to finish it off in the oven. The leftovers also reheat nicely. I recently tried out the new line of simmer sauces from Simply Organic, a company whose spices I buy regularly and have a variety of in my cabinet. I’m excited about their new sauces because, sometimes, it’s just too much work to make your own sauce, am I right? Especially when there are other homemade components to a dish like this one. This recipe features the Classic Fajita Simmer Sauce, which has simple and clean ingredients like chilies, green pepper, onion, cumin and smoked paprika, and no sugar – which can be shockingly hard to find in packaged foods! It comes in an easy pouch (no more wrestling with those tricky jar lids!). Simply Organic also gives back 1% of sales to support organic growers and the organic community, which I think is awesome. Even though the composition of this is layered like a lasagna, it all ends up baking together into a creamy, dreamy goodness. 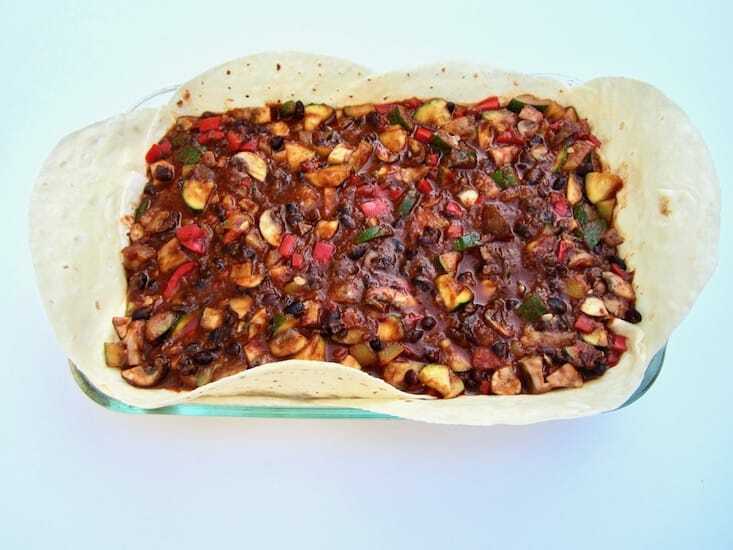 The tortillas make a base layer for the casserole, with some pieces sticking up above the sides of the baking dish, which then get crispy in the oven. It’s like having built in tortilla chips, adding some nice crunch! 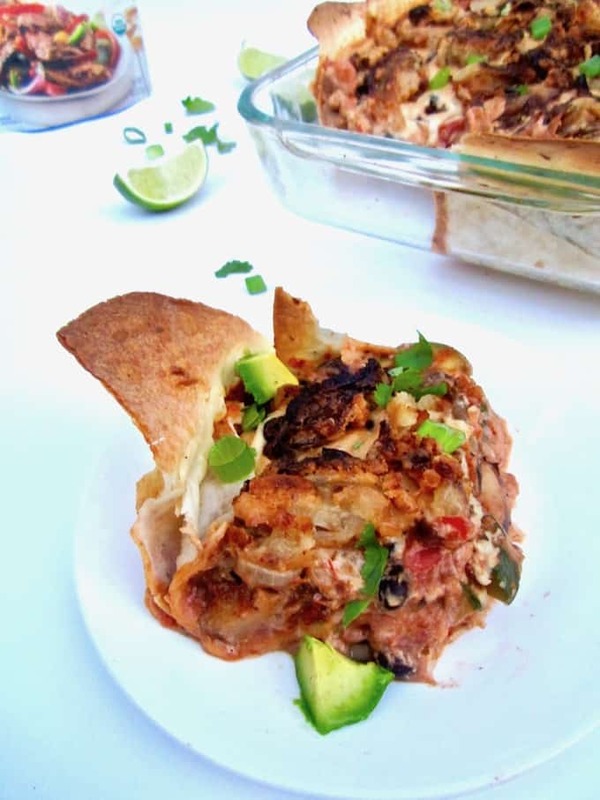 I recommend topping the casserole with some fun fixin’s for contrast – cilantro, green onions, diced tomatoes, shredded romaine lettuce, avocado slices and pumpkin seeds all make a great choice! 1) Layer tortillas into a 9 x 13 baking dish. I put two on the bottom, and then tore the remaining three tortillas in half to create 6 half moons, placing them straight edge down around the edges (2 pieces on each long side, 1 piece on each short side). I was so excited to find the most perfect vegan and gluten free tortillas at my local health food store, and relatively clean ingredients too. 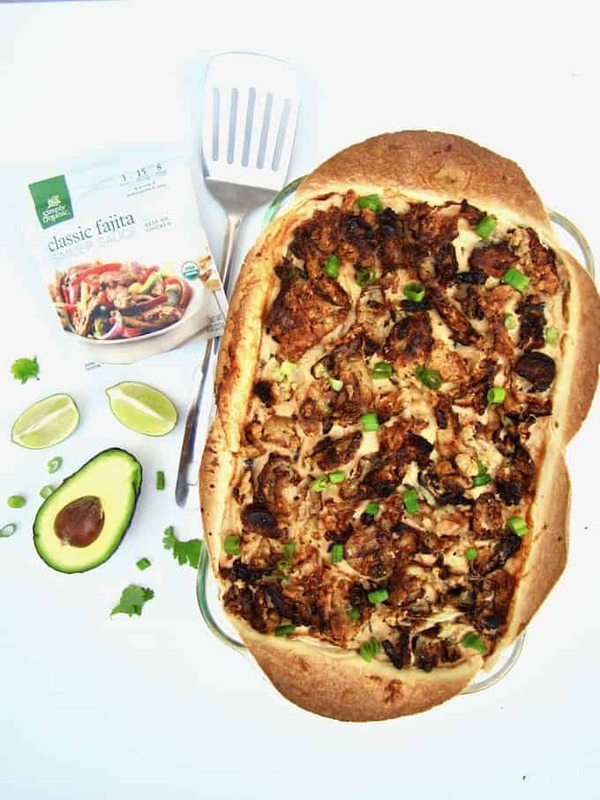 They are by far the best GF + vegan tortillas I’ve ever had – big, flexible and tasted just like regular tortillas! If you have trouble finding flour tortillas, you can use corn tortillas – they are just smaller so you’ll need more of them! 2) Mix together refried beans and diced tomatoes. Spread on top of tortillas. 3) Add sautéed veggies in fajita simmer sauce as the next layer. This photo below shows the tortilla base, refried bean/tomato layer (which you can’t see), and then veggie/sauce layer on top. 4) Smear cashew sour cream all over the top of this baby. 5) Top with crispy fried onions. So by the way… these onions, guys… Yes, they take a little extra time, but trust me – they are SO worth it!! Super crunchy, flavorful and reminiscent of those processed fried onions from the can that you put on top of traditional green bean casseroles. To me, these also taste like a fried onion strings appetizer you’d get at a restaurant. I want to make another big batch so I can just eat them by the forkful, and then have leftovers to put on, well, everything. ? I hope you love this casserole as much as I do, and remember to use Simply Organic Simmer Sauces to make your own #OrganicMoments! Thank you for supporting the brands that make Vegan Chickpea possible, and thanks again to Simply Organic for sponsoring this post! Hearty, healthy, family friendly and nourishing, this multi-layered casserole is comfort food at its best! Slice the onion into thin rings. Put in a large a bowl and cover with the milk. Allow to sit a few minutes. Combine almond flour, arrowroot flour, salt and pepper in a large ziploc bag. Give it a few shakes to combine. Drain the onions and add to the bag, shaking well to coat. Heat a large frying pan or cast iron skillet over medium heat. Add 1/4 cup of the avocado oil. When oil is hot, remove onions from the bag and add the hot pan. Do not overcrowd. I needed to do this in 2 batches. Be careful with the hot oil! You want it sizzling but not too high or smoking. As the onions begin to brown, turn them over. When golden brown, move onions onto a paper towel covered plate to absorb excess oil. Put aside. Spray a large casserole dish (13 x 9) with oil or use a non stick dish. Arrange 5 tortillas as the base layer. I put 2 flat on the bottom, and then tore the remaining 3 tortillas in half to create 6 half moons, placing them straight edge down around the edges (2 pieces on each long side, 1 piece on each short side). Mix together the refried beans and canned tomatoes in a bowl. Spread mixture in the bottom of the dish. Put a skillet over medium on the stove. Add 2 Tbsp water, then add peppers and sauté for a couple minutes. Add the zucchini and mushrooms. Stir and let cook a couple minutes. Then add the Simply Organic Classic Fajita Simmer Sauce and let simmer until veggies are just slightly softened. Preheat the oven to 375 degrees F / 190 C.
Make the cashew sour cream: Drain the cashews from their soaking water and rinse. Combine all ingredients listed under the cashew cream in a high speed blender, and blend until creamy. Spread evenly over the top of the casserole. Top the casserole with the fried onions. Bake at 375 degrees for 15 minutes. Allow to cool a few minutes before serving. Top with any desired toppings! 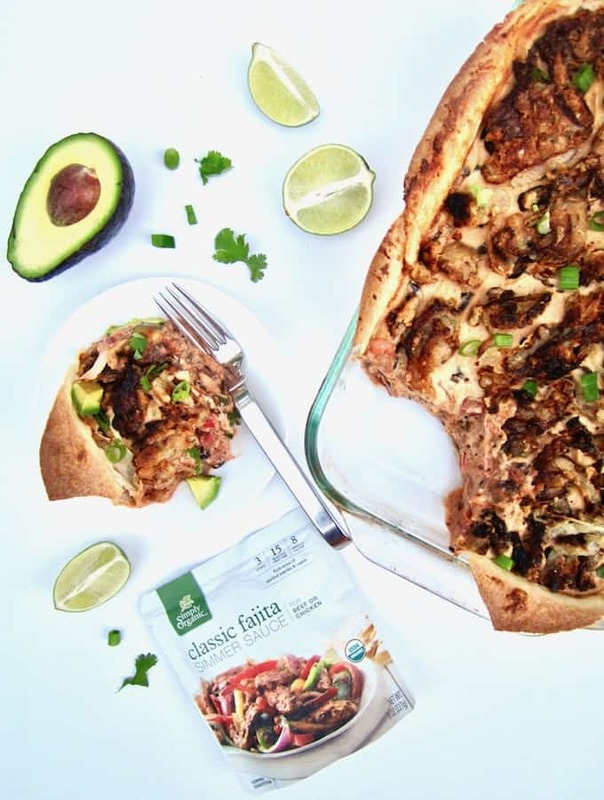 *If you have trouble finding gluten free & vegan flour tortillas, you can use corn tortillas – they are just smaller so you’ll need more of them! **You can also buy vegan sour cream if you don't want to make your own. That looks so delicious! 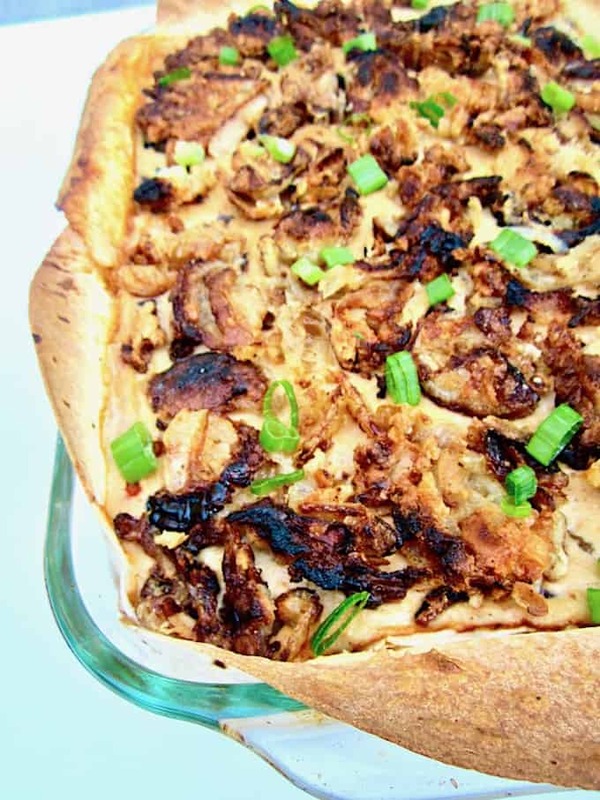 The fried onions, the cashew cream, the spices....so much flavor! I'm all about anything Mexican! We love it all and it's made around here at least 3 times a week! YUM! This looks amazing! I was actually just looking at this simmer sauce. I'm definitely going to try it now. And your recipe! Awesome Amy, great to hear! Thank you! Thanks Melissa, I recommend it - it has an adobo kind of flavor, and the ingredients are so clean, yay! I can eat this whole dish just looking at it! Looks so good! Ha, yes! It's definitely comfort food right here, but with less guilt for sure. ;) Thanks for commenting and I hope you enjoy it!! This is a great vegan recipe to make ahead. Looking forward to making it. 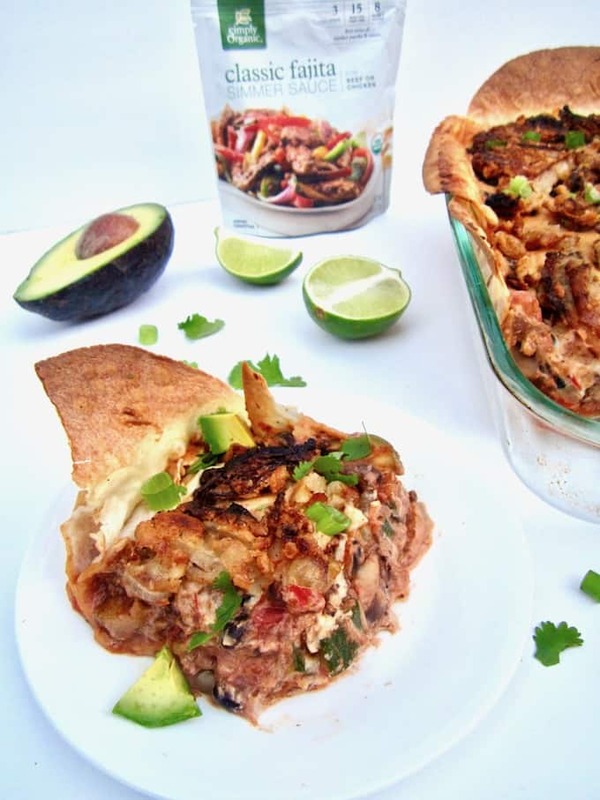 this is a brillant idea, I never thought of doing a casserole like this - yum! Thanks Madelyn! I would have never thought of it but was inspired by one of my favorite childhood meals. :-) I hope you try it and love it! Why wold you think this recipe to be free of sugar? Why would you want it to be? If there weren't sugars in it, it would be unpalatable. The wonderful sugars in the tomatoes and other ingredients make it what it is.